S. L. Farr, compiled by A Manual for Infant Schools: compiled by S. L. Farr; edited by Thomas O. Summers. 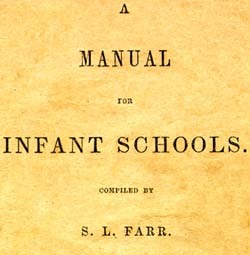 A Manual for Infant Schools: compiled by S. L. Farr; edited by Thomas O. Summers. Richmond, Va.: Soldiers' Tract Association, M.E. Church, South ; (Richmond: C.H. Wynne, Printer), 1863. Hymns, English -- United States. Methodist Church -- Catechisms -- English. Methodist Episcopal Church, South -- Catechisms -- English.